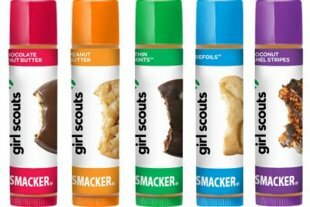 Lip Smackers + Girl Scout Cookies = Total Brilliance! These lip balms taste and smell just as scrumptious as the cookies. Thankfully they're hydrating too. Buy them individually or get all five in a set for $5 at Wal-Mart and Claire's stores. Come 2012 they'll be available in the liquid lip gloss version too. We can't wait to enjoy our Trefoils all year round!